Margra & John Kallenberger, Zion Lutheran Cemetery, Chattanooga, Mercer County, Ohio. 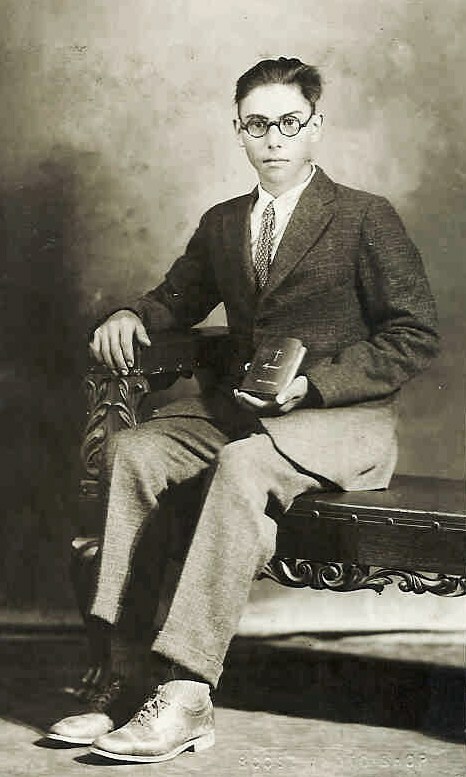 According to the records of Zion Lutheran Church, Chattanooga, Johann Andres Kallenberger was born 5 October 1910 to Michael and Maggie (Rueck Miller) Kallenberger. He was baptized 6 November 1910 and his sponsors were his maternal aunt and uncle, Johann and Carolina Müller/Miller. 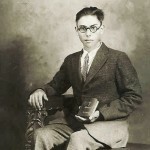 He was confirmed at Zion on 5 April 1925 by Rev. J.E. Albrecht. John married Margra Esther Burkhart at Zion on 25 August 1936 with Clara Fern Caffee and Paul Eugene Caffee as witnesses. Their marriage record states that John was from Willshire and Margra was from Monroe, Indiana. Note that the church records give a different marriage date than John’s obituary. John died 18 May 1995 and Margra died 8 May 1983. Margra E. Kallenberger, 73, R. 1, Willshire, died Sunday morning at Bradley Memorial Hospital, Cleveland, Tenn.
She was born March 18, 1910, in Adams County, Ind., the daughter of Edward and Georgie (Martin) Burkhart. 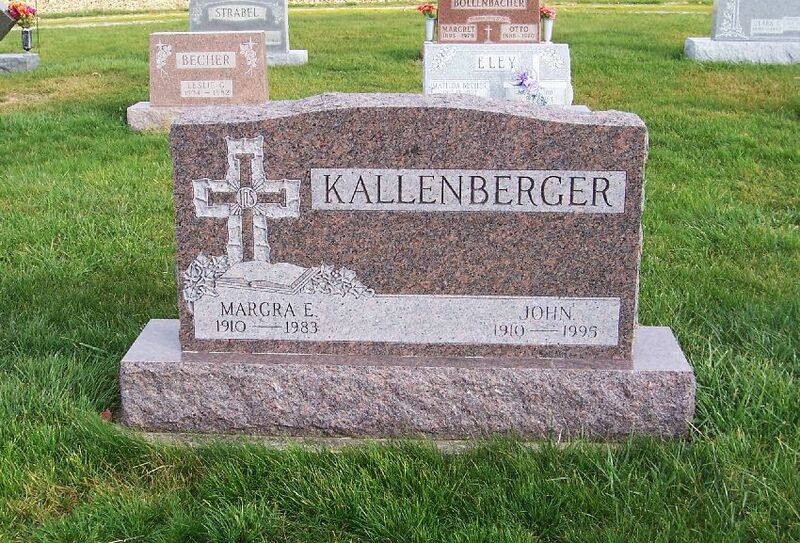 She was married to John Kallenberger, who survives. Also surviving are three sons, Leon A., Vancouver, Wash., Waldo, Cincinnati, and Jerome L., R. 1, Willshire; a daughter, Mrs. Paul (Anna Louise) Smeltzer, Cleveland, Tenn.; a sister, Mrs. Bessie Myers, R. 2, Ohio City; a brother, Donald Burkhart, Geneva, Ind. ; and 14 grandchildren. Mrs. Kallenberger at one time had been employed at the former Smith Nursing Home, Rockford. She was a member of St. John Lutheran Church, Hopewell Township. 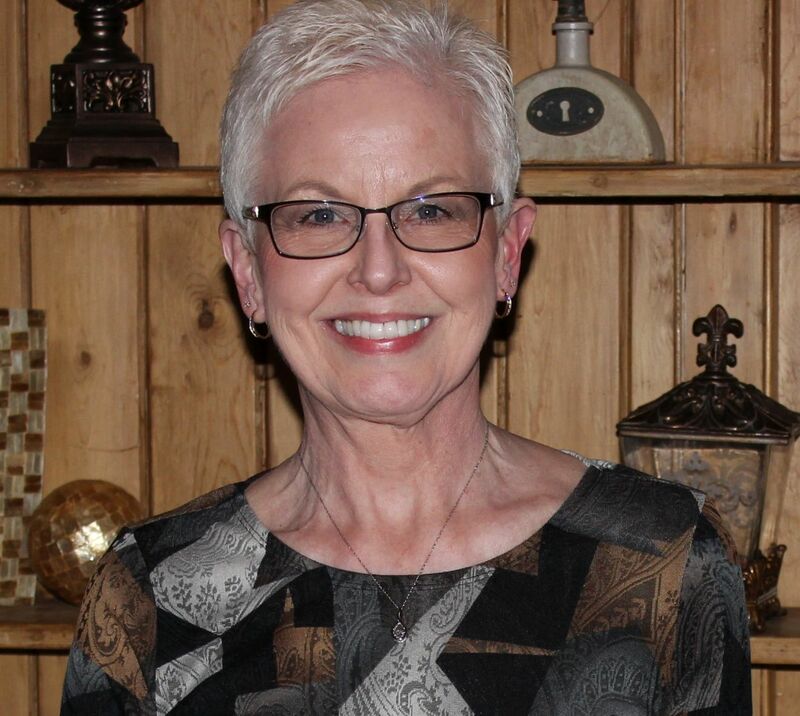 Services will be held Wednesday at 2 p.m. at Zwick-Boltz & John Funeral Home, Decatur, Ind. The Rev. Robert Carter will officiate and burial will be in Zion Lutheran Cemetery, Chattanooga. John A. Kallenberger, 84, Willshire, died at 1:20 p.m. Thursday at Van Wert Manor Nursing Home, where he had been a patient for two weeks. 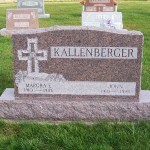 He was born Oct. 5, 1910, in Mercer County, to Michael J. and Margaret (Miller) Kallenberger. On Aug. 11, 1975, [sic] [should be 1936] he married Margra E. Burkhart, who died May 8, 1983. Survivors are a daughter, Anna Louise Smeltzer, Cleveland, Tenn.; three sons, Leon A., Vancouver, Wash., Waldo, Cincinnati, and Jerome L., Mendon; 14 grandchildren and 17 great-grandchildren. Deceased are a brother and a sister. Mr. Kallenberger retired in 1936 [sic] [should be 1975] after working 22 years at Central Soya. He was a member of St. John Lutheran Church in Hopewell Township. The Daily Standard, Celina, Ohio, 9 May 1983, p.3. The Daily Standard, Celina, Ohio, 19 May 1995, p. 5A. Amazing that two lives can be so summarily defined in such a short space with so few words. Yet you tie the generations together to paint such a full and lasting picture of the gifts each has brought and paved the path for the present. Only 3 Kallenberger tombstones remain unmentioned as you have noted Andrew & Elisabeth, Michael & Maggie, and John & Margra. Wes, Jane and Leonard also are buried among the markers at Zion Lutheran Cemetary. Four generations of family all together in one small cemetary. When Andrew moved to Ohio in 1864 (bought the farm) who would have guessed such a long and durable role in the community. Maybe that is why some of those older obituaries were so descriptive and long. They did tell much more about a person. I never really knew John and Margra. I remember that the school bus stopped at your house and John came to a garage sale at my parents’ home once. Curious, why the Celina paper? I would have never dreamed of checking there for obits! I guess as the county seat it must have the records, but have never read their paper and had no idea the family obits were even run there. Why not the Photostar or Decatur Daily?? Ha! I live closer to Celina, so it is much handier for me to look through The Daily Standard on microfilm at the Mercer County Public Library than it is to drive to the library at Van Wert and look through the Photo Star. Plus, The Daily Standard is a daily paper and larger than the Photo Star. The Daily Standard has many local obituaries. Johann and Carolina Miller are listed in a way that suggest that they were husband and wife at John’s baptism, but they were brother and sister, correct?? Yes, they were brother and sister. Interesting that they were identified as being from Willshire and Monroe, respectively, which seems really odd, but given that people who live in Chatt are from Rockford, I guess it makes sense.